Vice President Mike Pence was in Baltimore Friday, delivering a message of thanks to Customs and Boarder Patrol agents, and reiterating the Trump administration’s determination to build a border wall. He and Maryland's only Republican member of Congress, Maryland 1st District Representive Andy Harris, toured the Port of Baltimore. Pence discussed securing the port and preventing illegal drugs from being smuggled into the country. He also got a briefing on non-intrusive inspection systems. “i have to tell you.....would inspire any american.” In fiscal year 2018, the Baltimore Cffice of Customs and Border Protection seized more than 3500 pounds of drugs. 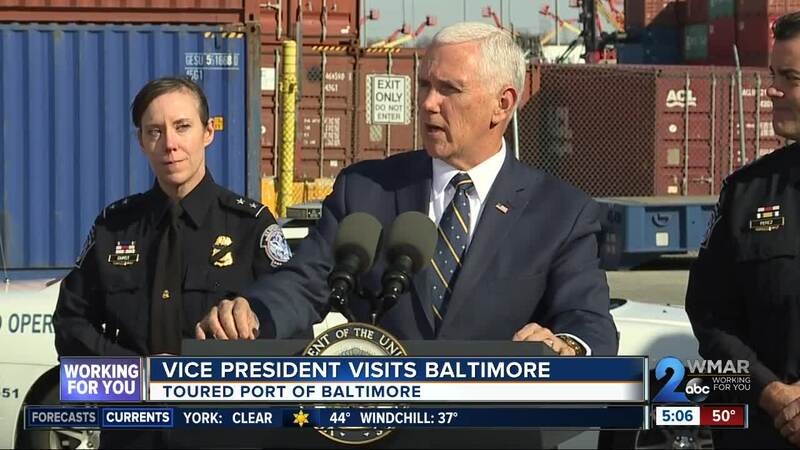 BALTIMORE — Vice President Mike Pence was in Baltimore Friday, delivering a message of thanks to Customs and Boarder Patrol agents, and reiterating the Trump administration’s determination to build a border wall. He and Maryland's only Republican member of Congress, Maryland 1st District Representative Andy Harris, toured the Port of Baltimore. Pence discussed securing the port and preventing illegal drugs from being smuggled into the country. He also got a briefing on non-intrusive inspection systems. In fiscal year 2018, the Baltimore Office of Customs and Border Protection seized more than 3,500 pounds of drugs.